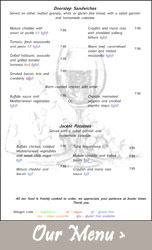 We believe that our menu should reflect the traditional style and values of the Old Spot. Eating is an in-formal affair here, its about enjoying good value, good quality food in a relaxed atmosphere! Gloucestershire, at every opportunity. Our menu includes both traditional & modern favourites, lighter options and our famous “Doorstep Sandwiches”. In addition we have a daily “Specials” board that always features fresh, seasonal dishes, to tempt you. Booking is highly advised. Of course, we have a large selection of Real Ales always available and there is sure to be one that will perfectly compliment your meal. Our staff are knowledgeable about the ales and will be more than happy to help you make your choice. We also stock a small selection of good quality wines that won’t cost you the Earth! We serve food at lunchtime, however, during the year we hold several themed Dining Evenings which can be anything from Tapas to Gourmet dining to the famous Gud Pud club! Please see Opening Times & Policy for more details. Please speak to our staff about the ingredients in your meal, when making your order. Our food is freshly prepared so we can adapt dishes to suit any dietary requirements or preferences.